The modern customer expects brand communications that are extremely relevant, timely, and on point. The truly omnichannel marketer needs to account for these increasingly sophisticated customers as they move between devices and platforms. From data mining to web analytics, savvy marketers know that finding and keeping consumers across channels rests squarely on the ability to personalize communications. Elements of personalization across channels include conversion reporting and analysis, platform-based analysis such as Facebook Insights and mobile app analytics, and customer-based analytics to create accurate segmentation, attribution and predictive modeling. By using these and other tools, marketers can capture and keep customers by targeting, testing, and personalizing communications across channels and platforms. 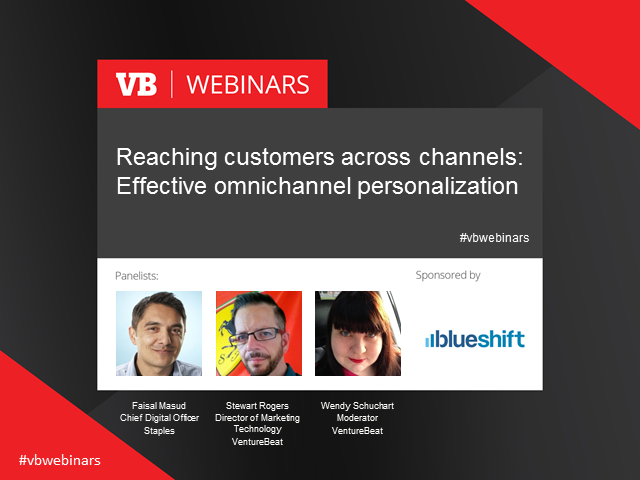 Join VB experts and other panelists as the steps to omnichannel personalization are identified. Register for this free executive event today!